JW Marriott San Francisco Union Square & Bloomingdale's Launch "Fashionista Insider Shopping Package"
SAN FRANCISCO, CA--(Marketwired - Apr 5, 2016) - The JW Marriott San Francisco Union Square and Bloomingdale's have introduced the "Fashionista Insider Shopping Package," which makes every day in San Francisco an adventure in style. Guests can look forward to a luxurious one-night-stay at the Forbes four-star-rated JW Marriott San Francisco, a luxury hotel in Union Square, and a VIP shopping experience just steps away at Bloomingdale's. The fashionable package includes a $50 Bloomingdale's gift certificate and two gourmet power bars to fuel a day of world-class shopping. Guests will enjoy a 15 percent all-day savings certificate at Bloomingdale's and other perks tailored for traveling tastemakers. In addition, guests can customize their stay in the heart of San Francisco with the Insiders' Guide to Union Square. Discover a wealth of information about places to eat, drink, shop and simply enjoy the best of San Francisco. *Subject to availability. Please contact 415-856-5477 or Sarah.Roach@bloomingdales.com in advance to book your cosmetics consultation. Starting at $249 plus tax, the "Fashionista Insider Shopping Package" is available now through December 30, 2016. The exclusive package must be booked 72 hours in advance and is based on availability. Book this exceptional Union Square luxury hotel package online or by calling 1-800-228-9290 and asking for promotional code ZH4. 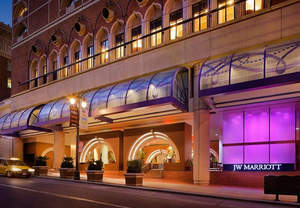 JW Marriott San Francisco Union Square is a luxury hotel in Union Square, San Francisco, located within walking distance from the Financial District, world-class shopping and a variety of cultural attractions. The hotel offers guests 24-hour personal butler service, 337 stunning guest rooms and suites, a state-of-the-art fitness center, the acclaimed Level lll Restaurant and Lounge and San Francisco's only 24/7 Club Lounge. Bloomingdale's showcases designer women's, men's, and kids' fashion, along with beauty and home décor. In San Francisco, guests will find five levels of fashion finds at the second largest Bloomingdale's in the country.